Do Diets Make Us Fatter? Why is it that those who diet the most are more likely to be overweight? Are diets making us fatter? Yes, say some obesity researchers. Going on a “diet” is not the answer to the nation’s obesity problem. For many extremely overweight people, repeated dieting only makes their weight woes worse. This post is from Joanne P. Ikeda, MA, RD Nutritionist Emeritus and Co-founder of the Center for Weight and Health at the Department of Nutritional Sciences University of California, Berkeley. Ikeda has conducted research on a wide variety of obesity-related issues. In one study, I surveyed 149 obese women (weighing between 200 and 600 pounds) about their life-long dieting struggles and practices. While you may think that they would have said that they did not diet, considering their size, these women had repeatedly tried calorie-restricted diets. I found that 60% of the women had dieted more than 11 times, and this figure increased to 83% for women at the highest weights. 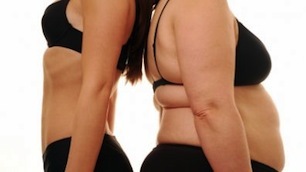 “The first time, they will lose a significant amount of weight, then regain a few pounds more than they lost. The second time it will be more difficult to lose weight. They won’t lose as much as the first time. The weight regain will be faster and greater than the first weight regain. Other studies have found similar dismal results with repeated dieting. The $30 billion dollar per year diet industry encourages overweight people to keep on trying to lose weight and many continue the frustrating yo-yo pattern believing eventually they will succeed. However, research shows that few do. I try to focus on helping individuals become healthy at every size. I recommend overweight women exercise regularly and eat a nutrient dense diet of approximately 1,800 calories per day. This type of eating plan will satisfy hunger with three reasonable meals plus snacks, in contrast to typical weight-loss diets of 1,200 to 1,400 calories per day. My goal is focused on improved health, not weight loss. This strategy will reduce the risk for chronic diseases, such as Type II diabetes, coronary heart disease and stroke.